DO YOU NEED TO APPLY A SEALER TO OUR STONE? Generally speaking, we do not recommend that you need to seal your stone. The impeccable quality of the material results in a product that does not require additional protective treatments. However, the use of a sealant may help aid in the ease of cleaning the material in the future. This is especially true of cooktops/countertops, areas that consistently stay damp or are shielded from the sun, or high traffic areas, etc. You may contact our office for more information on recommended sealers and cleaners. First and foremost – do not use any sort of caustic cleaners, masonry washes, acids, or products containing bleach on your stone. Even approved cleaners should always be tested on an inconspicuous area first! The density of the stone helps keeps outside elements from truly “staining” the stone. Discoloration is often limited to the surface rather than impregnated. This surface dirt is essentially “self-cleaning” via climatic elements. 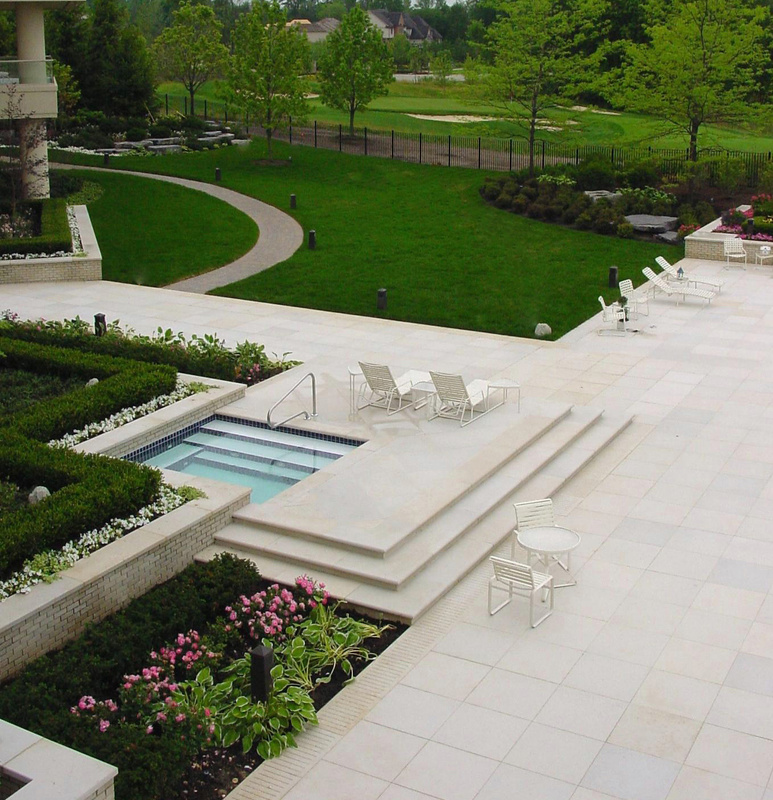 Normal “housekeeping” or maintenance of your natural stone involves an as needed washing with clean, potable water and a neutral (pH-7), mildly abrasive cleaner (i.e. Vana Trol made by Prosoco, Inc. in an 8 parts water to 1 part product dilution rate). If the area cannot be cleaned by scrubbing alone, we recommend the use of clean, pressurized water. The pressure of the water should not exceed 800 psi, and a 25° or greater fan tip should be used. Steam cleaning is also an excellent option for areas where pressurized water cannot be used. In the event that staining occurs, you may contact our company for further assistance. We will work with you and a qualified expert who can help pinpoint the type of stain, and best method of treatment. DO I NEED TO WATERPROOF MY STONE? 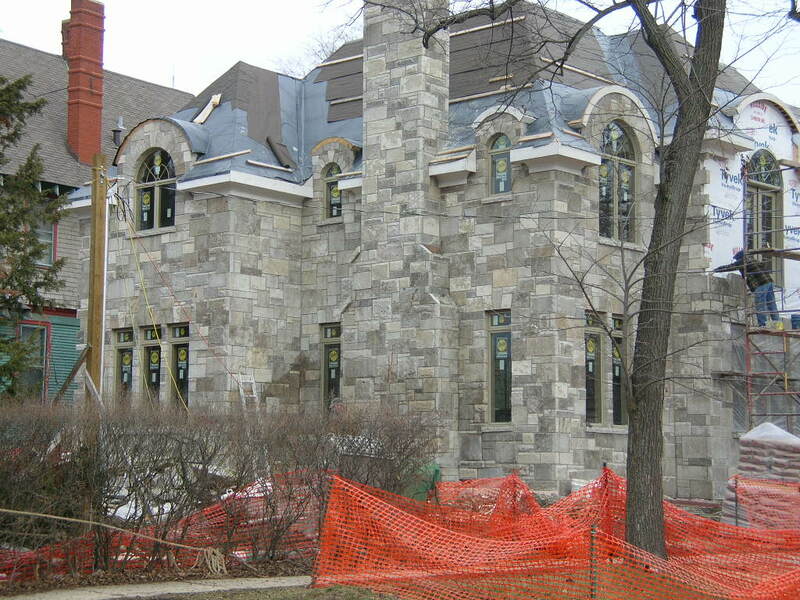 Many clients elect to apply a simple waterproofing agent to products such as veneer stone. This works to keep water from penetrating the stone as well as the mortar joints (which are more susceptible to water penetration). For protection from water penetration only (general waterproofing), Natural Stone Treatment (Prosoco) works well with our limestone. MY STONE HAS BEEN DAMAGED DURING OR AFTER INSTALLATION… CAN IT BE REPAIRED? Depending on the location and severity of the damage, the stone can be repaired. In extreme instances, the material would have to be replaced, but our staff will work with you to fabricate the closest possible match to the existing piece(s). For further information, check out our Stone Maintenance & Stain Removal Guide or contact our office at 920.477.2521. DOES NATURAL STONE CHANGE COLOR? Certain stones, based on their mineral content, formation, and how they are installed, can change color over time. Most stones will have a slight change within the first few months to a year after installation, but certain materials will show a noticeable difference. 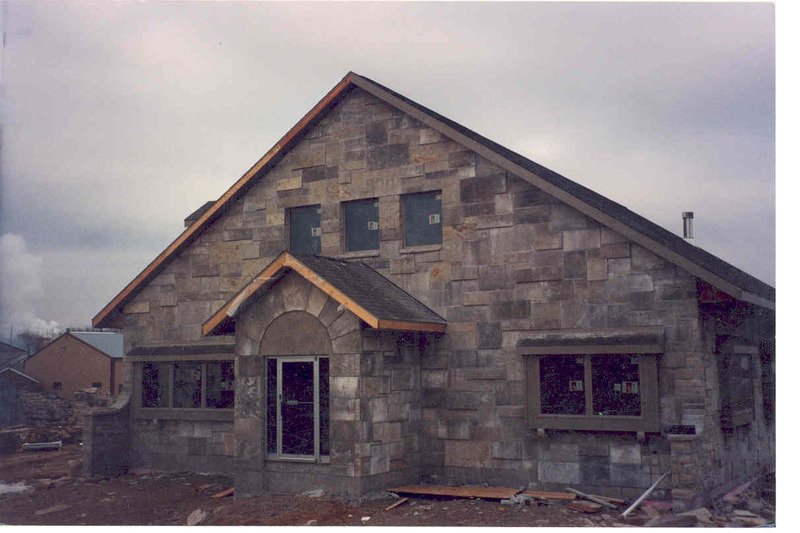 Many of our customers choose their stone based on photographs or installations they have seen in person, typically after the stone has achieved its final color. It can come as a surprise when the freshly quarried material arrives at the jobsite and looks to be a different color. There is no need to panic, this is normal. For approximately 425 million years, our stone has been buried and shielded from surface elements like wind, sun and rain. Formed in layers, each side of the stone layer developed its own color and texture as ground water passed through depositing minerals. 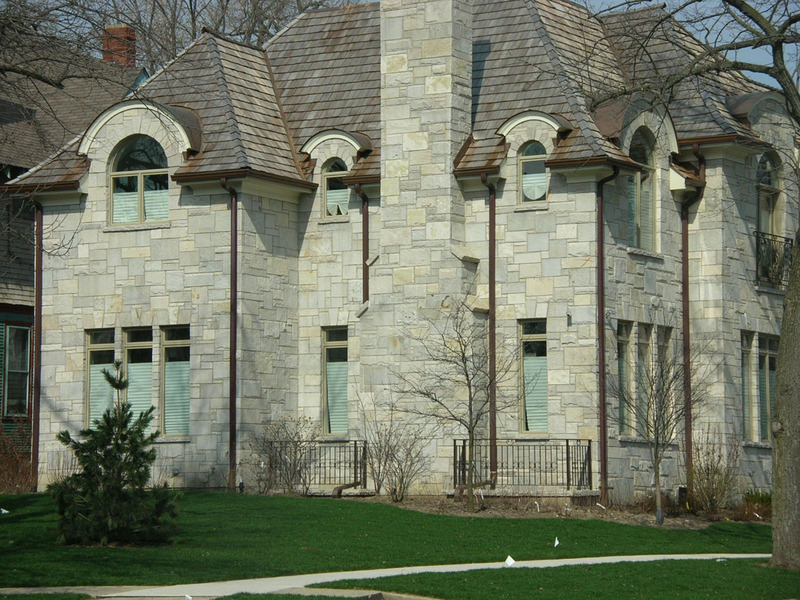 The “top” of the stone layer is referred to as its bedface side. This is the surface of the stone that will change the most once it’s installed and exposed to daily elements. Exposure to the elements is the primary factor in color change. Once the stone is out of the ground, air will begin to dry out the material and start the change. As water pushed minerals through these horizontal layers, moisture was trapped deep within the stone as it formed. 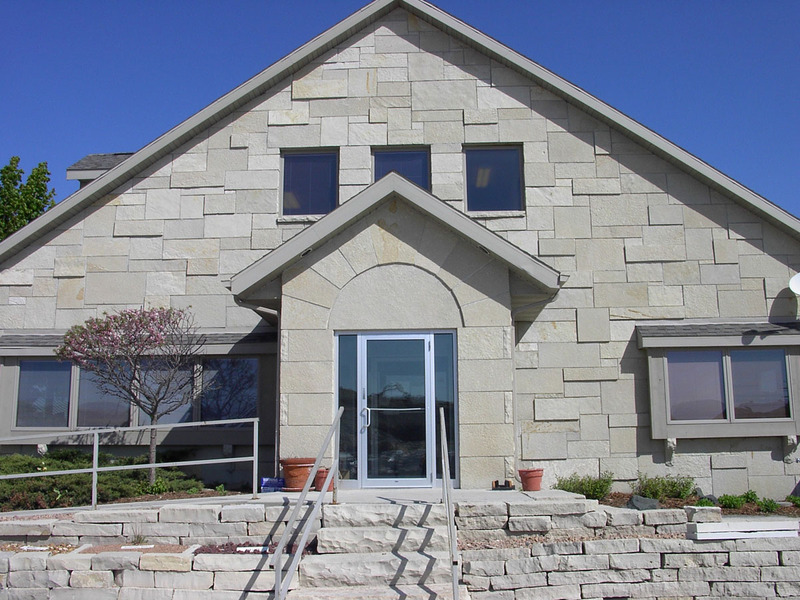 Because our Type III limestone is extremely dense, it can take months for this moisture to escape. As it dries, the color may slightly shift or lighten. But the greatest environmental factor, not surprisingly, is sunlight. Bedface veneer installed indoors or in shaded areas will have some slight change in the first year. Outdoor, western facing walls will see a more dramatic shift as sunlight fades darker tones. In the first year after installation, you will see the most noticeable change to your bedface stone products. The stone we know to have the most dramatic change comes from our Eden quarry. The bedface surface of Eden typically starts from buff or light gray to medium gray. After installation and exposure to direct sunlight, the color will change to a medium or rich buff tone. This subtle transition is so naturally even that you will likely not notice unless you compare pictures from the day of install to one year later. While our other bedface material will see a slight change, it’s typically a very subtle lightening. Even our brilliant Chilton bedface material holds its color for years in direct sunlight with only a slight evening of tones. As part of our commitment to our customers, we have assembled some cleaning tips and guides to help you enjoy years of quality natural stone products.